To take Downtown Marietta Survey, click here! Downtown Planning is happening within the City of Marietta! During the first week of February (1st and 2nd) the Enrich Marietta Team, a Downtown Planning Steering Committee, in cooperation with OHM advisors will be circulating a survey to persons who live/work/care about downtown Marietta. Along with that survey, the Team will be available in several locations to engage with the community. For the past six months, this group has been meeting in an effort to continue growth planning for Downtown Marietta. The group is made up of persons from various organizations within the community all with the goal of improving the downtown experience for those in our community and those yet to come. This process was established through the partnership of the City of Marietta and Marietta Main Street to create a downtown economic plan. The 21 question survey will ask a series of questions that cover a multitude of topics from downtown living, transportation preferences, types of projects to pursue, and overall community identity. It is important those of you reading this know why and how this information is being collected. Being thrown a survey that you haven’t been prepped for feels more like a test than a fun exercise in casting the vision for our community. We aren’t aiming for a test, we are aiming for genuine feedback from people who care about our lovely and vibrant downtown. The feedback we received will help us prioritize the community’s recommendations and construct potential projects and policies that will improve our community. “A community that is fully engaged will always lead to a more meaningful planning process because the public has inserted themselves into the decision-making of projects, policies, and programs that will affect them,” said Sam Tuten, Executive Director of Marietta Main Street. On February 1st, survey kiosks with the Enrich Marietta Team members will be placed at Jeremiah’s Coffee and the Marietta Brewery Company from 5-9:00 p.m. and on February 2nd, team members will be at Marietta College during their Winter Weekend from 12-4:00 p.m. before and after the basketball games. Look for volunteers with survey instruments and engagement activities and be ready to take part in a critical process that will move our community forward. More opportunities for the community to engage with the Team will be at the Main Street West Neighborhood Meetings held at the Boys & Girls Club on February 17th from 6 to 8 p.m.
Should you not be out and about the survey is also available online at www.enrichmarietta.com/engage. 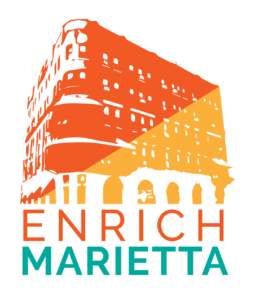 The opportunity to be surveyed and engage with the Enrich Marietta Team will be over a month (February and March) and we look forward to hearing your feedback and using it to shape the future of our downtown.